Once upon a time in a town far, far, far. . . . Were you thinking Farmville? Why, yes, it is Farmville and since it’s December, it’s time for Waterworks Players’ much anticipated annual pantomime. While common in Great Britain, pantomimes, or pantos as the Brits say, are not as familiar here in the U.S. but thanks to Mary Jo Stockton and Dudley Sauvé, we now have an established and very popular tradition of this unique and entertaining storytelling here in Farmville. A pantomime is a theatrical production usually based on a fairy tale and primarily for children, although the combination of narrative, music, and joke telling aided by a healthy portion of slapstick comedy are also appealing to an adult crowd. This year’s “May The Farce Be With You” is no exception. Directed by Mary Jo Stockton, the pantomime is cleverly based on two interconnecting stories: Jack and the Beanstalk and a parody of Star Wars. Imagine your favorite characters from Star Wars walking into the Jack and the Beanstalk story and then picture Greg Tsigaridas with a light saber and a few dance numbers, Leigh Lunsford in gold as a female robot, and the hilarious Chris Klinger as a middle-aged woman with a golden goose and you’ll start to get an idea of just how entertaining this year’s production really is. The unusual combination of the two stories keeps the audience from too many pre-conceived expectations about how the story will develop, all of which result in a fresh, cleverly told new story that delivers a satisfying experience for the theater goer. The 2015 pantomime has a big cast and this year they are exceptionally strong. 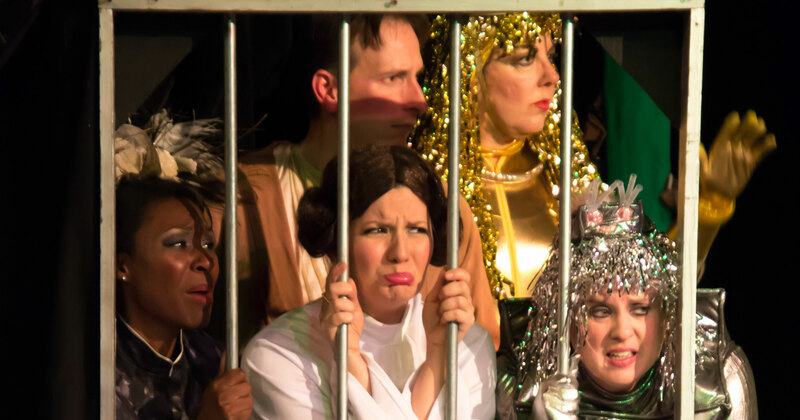 From the youthful and energetic Super Troopers to the lovable Demi Mooer, played by Sarabeth Roberts and Andra Henke, there is an energy and brightness to this production. It’s always fun to see so many of Waterworks’ finest on stage together and the result is super entertaining. Veteran actors Jordan Whiley, Leigh Lunsford, Greg Tsigaridas, Chris Klinger and Brandon Nuckols play alongside more recent talent (notably Sherry Davenport, Tiffany Lewis and Brittni Cogdell) to deliver a first class pantomime. It is clear that this year’s cast loves working together and together they create a lot of chemistry and hilarity that keep the audience laughing. Pantomimes encourage audience participation, so children will love the opportunity to boo the evil Garth Invader (Jordan Whiley) or shout out warnings to Nellie (Chris Klinger) and Jack (Brandon Nuckols). Show times are Fridays, December 4 and December 11 at 7:00 p.m. There are two shows on each of the following Saturdays, December 5 and Saturday December 12 (2:00 and 5:00 p.m.). Tickets are just $5.00. Remember that last year’s pantomime sold out so get your tickets soon. Tickets may be purchased online at www.waterworksplayers.org. When you purchase your tickets online, you can select your own seating. Don’t miss the show!